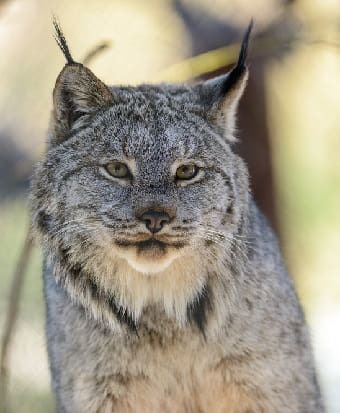 The Canada Lynx, who is a relative of the Eurasian Lynx and a member of the cat family, inhabits parts of the United States including Alaska as well as Canada. It lives in the boreal forests or coniferous forests where swamps, bogs, and rocky areas are present. They are equipped with very thick fur and exceptionally large paws. The reason why they have these adaptions is to protect them and aid them in the snowy habitat in which they live. The facts and information provided below give some highlights as to what makes this animal so interesting. This information is written for both kids and adults. Click here for a great selection of Amazon.com books about the Canada Lynx. The Canadian Lynx are carnivores, known to prey on mice, birds, red squirrels, voles, ptarmigan, and grouse but the main portion of its diet comes from the snowshoe hare. The Canada Lynx will often cover their prey with a layer of snow to be eaten at a later time. The female lynx will give birth to between 1 and 6 kittens but the average is a litter of 2 to 4 kittens. The population of the Canada Lynx has declined to the point that it was put on the list of threatened animals in the United States. Human factors such as urbanization are the main reason for their decline. Mating season lasts only for a month but occurs in the spring somewhere between March and May, depending on the climate. The Canada Lynx is an extremely elusive animal. It rarely seen by humans and has earned the nickname "shadow of the forest". The Canada Lynx makes a variety of sounds or vocalizations which are similar to a domestic cat. They purr, meow, hiss, growl and shriek to show different emotions and during mating season. The Canada Lynx have very keen eyesight which helps them to hunt at night. They also have excellent hearing, sensitive whiskers, and very quick reflexes that also help them while night hunting. With the exception of a mother and her kittens, the Canada Lynx is a solitary hunter. The Canada Lynx will climb trees with ease and often sit on a tree branch waiting for prey. Once prey is spotted, it will quickly leap from the branch and pounce on the surprised animal. After a kill the Lynx has to be cautious of animals, such as wolverines, looking to steel the prey. The wolverines aggressive nature will force the Canada Lynx to leave its prey. Several characteristics make this animal easy to recognize. It has pointy ears that are shaped just like triangles and have black fur at the ends that stick upright. This animals tail is short and stubby in proportion to the rest of the body and has a black tip. This animals paws are large and rounded with fur on the pads that act as snowshoes, allowing the Lynx to easily walk on the snow which often covers the boreal forest. It is a little bigger than an average domestic cat, weighing in at roughly 20 pounds (9 kilograms) with a height of about 20 inches (508 mm).